Lemon is one of my favorite flavors. I <3 lemon. I put lemon in my water. I put lemon in my Diet Coke. I love lemon piccata. It just follows that I would love lemon in my sugar cookies. 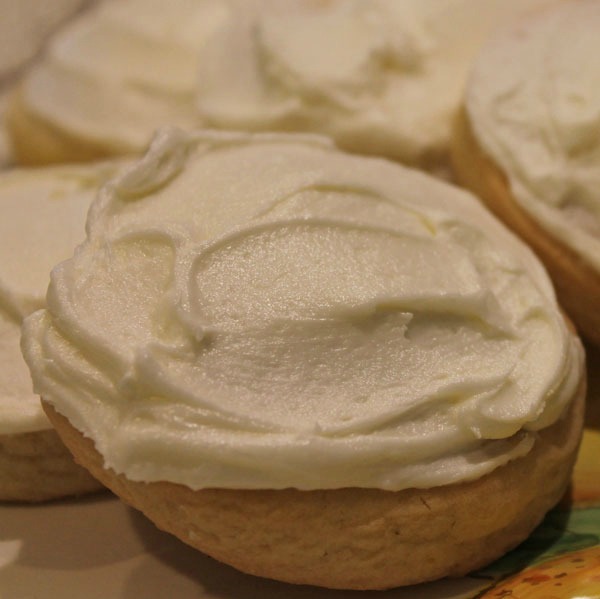 Sugar cookies with buttercream frosting are a favorite cookie. The ones I love have a not too sweet, cake-like cookie base that is topped with a tasty buttercream frosting. The frosting isn't fancy. It's just the most delicious buttercream generously swirled over the top of the cookie. They are oh, so yummy, that just writing about them makes my mouth water. 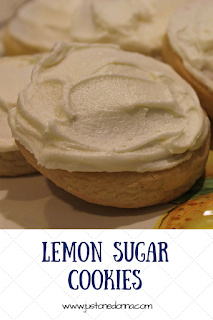 The only thing that could possibly make my favorite sugar cookie recipe better is the addition of lemon. I've been trying variations of the recipe this month and settled on this one to share with you. 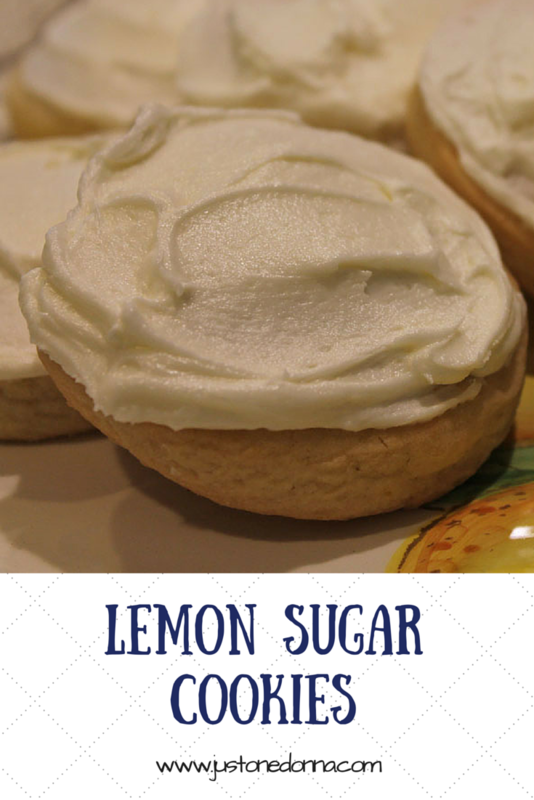 If you love lemon and you love sugar cookies then you will love this recipe. This is a very forgiving sugar cookie recipe, but if you'd like some tips to ensure your success read my post, How to Make the Best Ever Sugar Cookies. To make the cookies: In a large bowl, mix the butter, sugar and lemon juice with an electric mixer until light and fluffy. Add the eggs, one at a time, beating after each addition. Combine the flour, baking powder, baking soda, lemon zest, and salt. Gradually stir the flour mixture into butter mixture until well blended. Chill the dough for 2 hours. Preheat the oven to 400 degrees F. Knead the dough gently until it comes together is a smooth ball. On a lightly floured surface, roll out the dough to 1/4 inch thickness. Cut into desired shapes using cookie cutters. Place cookies 2 inches apart onto ungreased cookie sheets. Bake for 6 to 8 minutes in the preheated oven. The size of your cookies may affect your cooking time, so be sure to check frequently. The cookies should be golden but not browned. Remove cookies from pan and cool completely before frosting. To make the buttercream frosting: Using an electric mixer beat the butter until light and fluffy. Add the confectioners’ sugar alternately with the lemon juice. Add a little milk, if necessary, to achieve a spreading consistency. Continue beating until light and fluffy. Frost cookies and enjoy. Tip: These cookies freeze beautifully. Just be sure you let the frosting set well before packing the cookies for freezing. I like to use waxed paper between my layers of cookies when freezing. 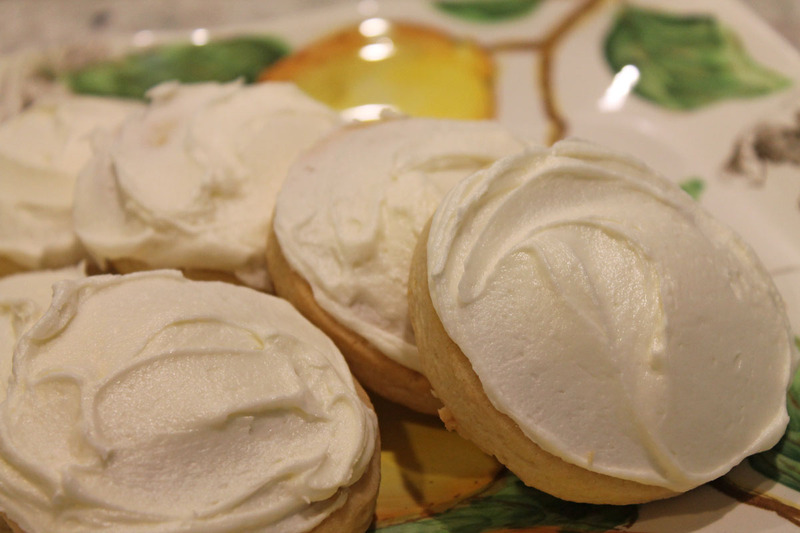 Sugar cookies with the buttercream frosting are my FAVORITE. I LOVE THEM! I will have to try this with the lemon and maybe stick this in a bowl of berries. Mmmmm. You always make me hungry LOL! Sugar cookies are my most favorite. I love how simple and yet delicious they are. I cannot wait to try this recipe out with my three girls.